There’s no point denying the differences between the hair in African-American and European-American people. It’s not only the wave pattern that is different, but also the texture as the African-American hair is typically coarse, kinked or coiled. As for the color, it’s quite obvious that African-American hair is black 99% of the time (the variations aren’t common at all). However not many of us notice that African-American hair does present even more special characteristics. The African-American hair has the tendency to be porous, therefore moisture goes through the cuticle layer of the hair way easier. As ethnic hair is coarse most of the time, the cuticle layer of the hair shaft is going to raise. This means that it loses moisture as easy as it absorbs it. This is why African-American (let’s call it “ethnic” going forward) needs a bit more attention in order to remain healthy and strong. Black hair is the darkest one and very popular on Earth as people with this type of hair are so numerous. It’s an important genetic trait that we’re going to find in people of all sorts of ethnicities and backgrounds. It contains an important amount of eumelanin and it’s less dense than the other hair colors. It’s quite common for a very dark brown hair to be mistaken as black hair. The range of skin colors that are related to black hair is quite impressive, going from the palest of light skin tones to dark skin. Black hair does needs oil for an effective protection and this method goes back to ancient Egypt. The oils become a good sealing barrier to keep in the hair’s moisture, leaving your hair soft and easy to manage. What about hair loss for the African-American hair? One of the most common problems for Ethnic hair is dryness. This is the reason for which products made for African-American hair include intense oils, moisturizers and fats that hydrate and lock in moisture at the same time. On the other hand, one recent national study shows that another important problem for women with Ethnic hair would be breakage. It seems that 60% of black women pointed breakage as their no.1 hair issue. 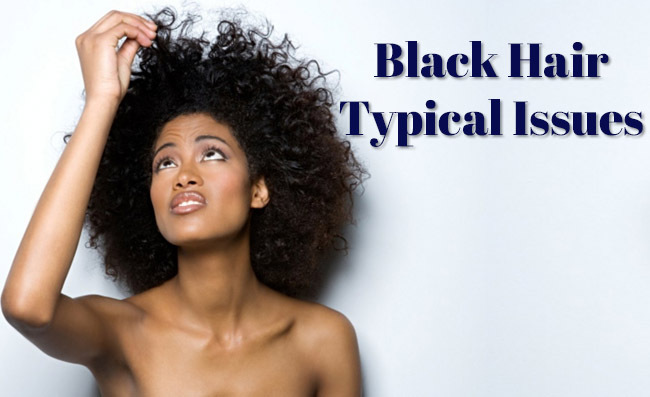 It goes without saying that the natural tendency of black hair to dryness isn’t much of a help and is so important when it comes to hair breakage in women with black hair. How they style their hair is also very important and 80% of black women use some sort of way to straighten their hair. From the chemical processes (relaxers and soft-curl perms) to the heat-styling appliances (blow-dryers and irons), the methods of styling are various and present risks, especially when not properly used. For instance, chemical relaxers are powerful formulas that break the disulfide bonds of the hair, helping it to lie nice and straight. Most common relaxers include strong alkalis that expand your hair up to twice its normal size. The hydroxide relaxers cause permanent breakage of bonds. Soft curl perms make the natural curl of the hair become larger, but both soft curl perms and relaxers are quite powerful on the hair. Heat styling is another cause for the issues of African-American hair. Flat-irons, curling irons and straightening combs use heat that goes up to 400 degrees. Let’s not forget dryers (hooded included) that you’re using for straightening as they take out much of the moisture that your hair needs. Coloring is another chemical process that may damage quite tremendously your African-American hair. As your Ethnic hair is typically black (level 1), no matter which color you want to go with, you’re going to have to use some sort of bleaching that may cause serious damage, when you’re not doing it right. You shouldn’t go more than 4 to 5 levels from your natural color and this means that you don’t have that many options if you’re an African-American woman. This means that it’s not impossible to see African-American women go 8 to 9 levels higher, getting to a bright blonde. This type of lightening may cause straw-like texture on your hair, even if you’re doing it in a professional salon. Needless to say, you should never try to do it on your own at home. This explains why some high-end African-American professionals talk so much about the risks of over-lightening of African-American hair. Keep in mind that you can’t really “cure” damaged hair. However, you may treat your hair with products that are going to protect it from anymore damage, giving your hair a healthy appearance. Give it a second thought next time you’re going to lighten your hair. The moment you run your fingers through your hair and end up with a handful of broken ends is the moment you realize it’s already late for your hair. All the processes that your hair is going through leave your hair stressed-out and weakened, with a higher risk for breaking. This is why you should treat your African-American hair as often as you can in order to strengthen it with proteins, but also re-hydrate it with moisture that seals the hair against moisture loss. You must always use the products that address to these specific problems. No worry though, as the market is always giving you more and more products especially designed for African-American hair. Using a gentle shampoo and conditioner that contains moisture-rich ingredients is fundamental for the African-American hair and you should condition daily, even if you’re not shampooing daily. Get yourself a light, oil-based treatment to seal in the moisture and to protect your hair against damage from all of that styling. And if you’re also using heated appliances (chances are you do use them), you should step up your game. A deep-conditioning treatment once a week (but this is the minimum) and protein treatments at least once a month are things to check every month. Pay attention to the needs of your African-American hair and make sure to keep it healthy at all time. Thinning hair isn’t a problem only for men, as women also have to face this hair problem. It seems that 40% of people dealing with temporary or long term hair loss are in fact women. For some, hair is thinning all over, whereas others notice how the center part widen as time goes by. The cases when people develop baldness at the crown of the head aren’t that rare, but it’s true that women don’t typically experience a receding front hairline. Typically, an average scalp has around 100,000 hairs and each follicle gives a single hair that grows around half an inch per month. Hair grows for 2 to 6 years before taking a break and eventually fall out. But it’s replaced soon enough with a new hair, therefore the whole cycle starts all over again. No matter the moment in your life, chances are that 85% of your hair is growing whereas the rest is resting. Women dealing with PCOS present a chronic hormonal imbalance as the body produces higher levels of androgens than it should. This makes the hair sprout on your face and body, whereas hair on the scalp gets thinner. PCOS is also related to ovulation problems, weight gain and acne. However, thinning hair remains the most noticeable symptom. The butterfly-shaped gland at the front of our neck, the thyroid produces hormones that control several processes throughout the whole body. If this gland produces too much or too little thyroid hormone, the hair growth cycle is going to be altered. Hair loss isn’t typically the only symptom of some thyroid conditions. You may want to pay attention to weight gain or loss, changes in your heart rate, sensitivity to cold or heat too. an important number of women notice how their hair gets fuller during pregnancy. The high levels of hormones that help hair rest from falling out are responsible for that fuller appearance. Unfortunately, it doesn’t take long and right after childbirth, as the hormone levels go back to normal, the once fuller strands are going to fall out. And women may experience an impressive amount of hair loss at one time, taking around 2 years until hair goes back to its normal condition. This is no myth at all: stress does kill. Stress is also an important cause for hair follicles to become toxic, making your hair fall out. You may have seen it in the movies how people may pull their own hair, but it’s stress that can do that for you. A stressful period in your life may cause hair loss so you need to minimize stress as it’s going to affect not only your hair, but also your entire body and mind. It’s not very well known, but a side effect of birth control pill is the hair loss. The same hormones that control ovulation may cause thinning of hair in some women, especially those coming from families with hair loss experiences. Hair loss may stop the moment you stop taking the pill. Keep in mind that some blood thinners and medicines that control high blood pressure, arthritis, depression or heart disease may also cause hair loss. This is a special condition that makes the hair fall out in amazing patches. The body’s immune system is the one to blame in this case, as it’s mistakenly attacking hair follicles. The damage isn’t permanent though, most of the time. The missing patches may grow back in six months or so. However, in rare cases, people may in fact lose all of the hair from both their scalp and body. Next Next post:Does African Black Soap Lighten Skin?